Utilize your cubic airspace effectively. The affordable way to double your floor space. Mezzanine Options -- please consult dealer. Load bearing to 250 PSF. 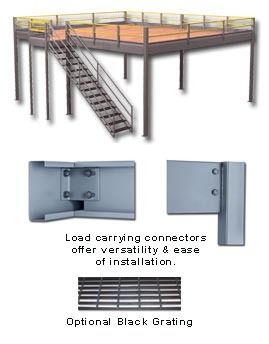 The design of INSTANT-SPACE modular components provides the ability to modify your mezzanine at any time. This allows the accommodation of future growth and to ensure the most efficient use of warehouse space. INSTANT-SPACE mezzanines are rated at 125 PSF with 5 x 5" post size (minimum). Offered without decking or with a galvanized steel deck and 3/4" O.S.B. With a limited number of components (columns, beams, and joists), the mezzanines are easy to assemble and take apart. Clear height of 8". FOB Shipping Point.